James Edward Paarmann, 85, of Girard, passed away at 11:08 A.M., Tuesday, September 4, 2018 at the Medicalodge of Girard. Jim was born February 21, 1933 in Sheboygan, Wisconsin, a son of Arno and Geneva (Kerskamp) Paarmann. He attended school in Sheboygan, graduating from the Central High School. He later graduated from diesel engine school, he also attended PSU. James served in the US Army from 1954 until 1956. On June 5, 1954 Jim was united in marriage to Annette Paasch in Sheboygan, Anne survives of the home. They made their home in Rockford and later Rochelle, Illinois, and the Philippines before moving to Girard in 1966. James was a power plant engineer for the City of Girard and later, a coal miner for Clemmons Coal Company in Mulberry, Kansas. 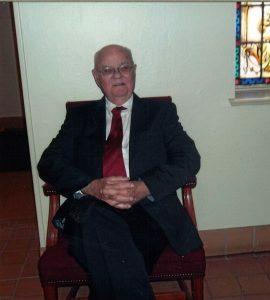 He was a member of the Lutheran Church, the Girard Lions Club, and the N.R.A. James enjoyed his family, rifles, and shooting. Survivors in addition to his wife include one son; James Paarmann II, and his wife, Renée, of Nevada, Missouri, two daughters; Jeanine Feola, and her husband, Thomas, of Rosehill, Kansas and Ramona Paarmann of Buckeye, Arizona; his grandchildren, Aaron, Tara, Keagan, Samantha, Brianna, Vaden, Ellaria, and Marianna; his great-grandsons, James, Dominic, Brett and Demetri; one brother; Michael Paarmann of California. James was preceded in death by a son, Steven, in 1966, and a sister, Shirley Jacks. Memorial services will be at 2:00 p.m., Saturday at the Smith-Carson-Wall Funeral Home in Girard with Pastor Thomas Wehrman officiating. The family will receive friends from 1:00 until service time. Friends may call after 2:00 p.m., Friday at the funeral home. Memorials are suggested to a Technical Scholarship at the Girard High School and these may be left at the Smith-Carson-Wall Funeral Home,518 W St. John, Box 258, Girard, 66743.